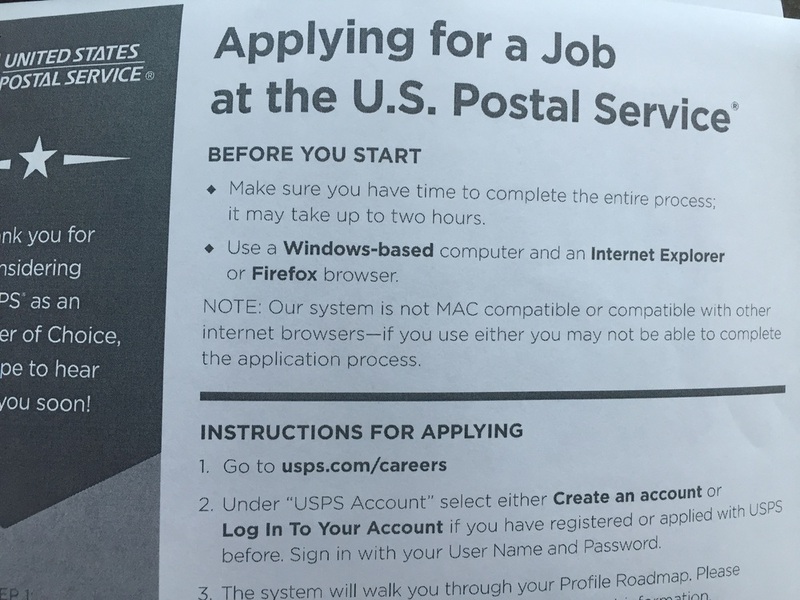 I was standing in line at my local United States Postal Service (USPS) when I saw the flyer pictured above. No I don't intend in applying for a job at USPS but what catches my eyes was the requirements to fill the application. See USPS it's so bad at tech that in order to apply online for a job you MUST use a Windows based pos PC and get this only Internet Explorer. WTF? In this time and age is so stupid that only outdated technology be required for anything. Yes outdated as that what Windows OS and Internet are outdated pieces of technology that while need to be supported should never be the only option. I hope USPS gets with the time and embrace new more robust platforms like OS X, Chrome OS, iOS, Android OS, Safari, Chrome and Firefox.